October 21, 2015 is the date that holds a special place in the hearts of all Back to the Future saga fans. This is the date Marty McFly arrives on when he time-travels in the second movie of the series. The movie has become a cult classic. Robert Zemekis, the film director, and Bob Gale, the screenwriter, did not just make a first-class movie which became a true commercial success – they turned out to be quite apt futurologists and managed to foretell certain present-day phenomena back in 1989. Let’s be honest, predicting a feasible future 26-years in the past with more accuracy than say a weatherman, is unheard of. So we can excuse some of the predictions in Back to the Future II that didn’t come to fruition. Perhaps the most glaring mistake was the lack of ubiquitous Internet. In 1989 we had email, news groups, IRC chats… yet, it was a token of the geek world, hidden from the common folk and businesses. No wonder the creators of the movie, in their attempts to extrapolate tech development onto the time 26 years ahead, just missed this topic completely. Who knew it would be like this today? However, the phenomenon both Zemekis and Gale were very familiar with – television — was depicted quite accurately. Ubiquitous large flat-screen TVs – check. The overwhelming popularity of 3D video – check. Simultaneous picture-in-picture and picture-by-picture viewing of six TV channels is absolutely no news today (well, it was a far-fetched shot for 1989!). Holographic outdoor projections… Not yet, but they should be around in no time: a number of prototype technologies are currently underway. ‘Jaws 19’? The movie has obviously not been releases just yet (however, the crew could not resist to launching a special trailer to celebrate the date). However, this subtle hint onto the current prequel/sequel/spin-off hysteria cannot remain unappreciated, heh? Once someone manages to produce a decent storyline – and there you go. Another Back to the Future II blooper has to do with mobile phones and personal gadgets – or, more accurately, with their absence. There are, however, some meaningful nods onto currently available tech concepts: these are Doc’s binocular camera, a tablet to sign petitions, video glasses… At the same time, they all exist in conjunction with obsolete phone booths and abundant paper media – all in all, it looks unlike our present reality. The role of today’s communication devices in Back To The Future was taken over by fax machines – as fancy back in 80’s as it is lousy today. However, the fax machine ejecting Marty’s dismissal notice is seen by many as a foregoer of today’s multi-display paradigm. The unfortunate failure with predicting the existence of smartphones is decently balanced out by very realistic video chats. Take the caption at the bottom of the screen referencing hobbies and names of the interlocutor’s children – it does have some connection to modern social media profiles. The dinner scene in which children completely ignore their family being too distracted by their video glasses, is strikingly similar to today’s reality – maybe Google Glass should re-watch this scene – not in the direct meaning though. 3. O why can’t people fly? Good job so far, Zemekis, but with all those flying cars and skyways you went a bit over the top. Companies like Terrafugia and AeroMobil have been promising to introduce affordable and convenient combined vehicles which would be able to ride both terrain and sky roads. Since then all these attempts were futile and the due date for commercial vehicles is being regularly pushed back year after year. So, sadly, we have no chance of getting a $39,999.95 flying car in the imminent future. As for the drone hysteria, Zemekis’ idea is quite accurate. Griff’s gang’s fiasco has been instantly reported by a USA Today automatic reporter – a thing not uncommon in our times. While today’s media have not started to employ drone reporters, this may become a trend in the not-so-far-future. Curiously, the report on the mayor office wreckage was by-lined by some ‘Compu-Fax’ author. Nice guess: robots already write news instead of regular journalists, and this is only beginning. We can only dream about rejuvenation clinics, which help to replace old organs (like in Doc’s case), or make you look 17 when in fact you are 47. Of course, medical science moves into the right direction, but way slower that we’d want it to. Speaking about cyborgization, Zemekis and Gale projected it to happen too soon, yet the progress this industry has made so far is striking. At least, electronic hand prosthetics or eye prosthetics are still unusual, but at the same time quite real. The idea of automated justice yielding a verdict in minutes looks quite inviting. However, greedy attorneys and years-long court hearings are to stay for decades to come. With regards to low-profile jobs, people might be replaced by robots in no time. Hotels, hospitals, fast food restaurants – all of them are already experimenting with automating parts of human roles. While we don’t have fully automated waste bins yet, we already have those genius robot vacuum cleaners. Also, you can perfectly manage on your own when ordering at an automated counter at McDonalds or Chili’s Bar & Grill – just as simply as you would order Pepsi at Cafe 80’s. We wouldn’t say no to weather forecasts which would foretell it would stop raining with a second’s precision. In 26 years, weathermen made significant progress, however, supercomputers and advanced multifactor modelling tools still let them down from time to time. One great insight into the future in the movie was the biometry. Characters mostly use fingerprints to open doors – well, who would know that those would be mostly needed to unlock a smartphone nowadays? A dehydrated pizza, which grows in size in seconds when put into a food hydrator is still a projection for the distant future. Microwave food today is also very popular, but is not that advanced. Quite the opposite: there is a clear trend of choosing organic healthy food (at least it seems so). To continue on the home-relevant topic, let’s praise creators of the movie for another accurate guess on voice controls for home electronics (in the scene with a Garden Center fruit dispenser). 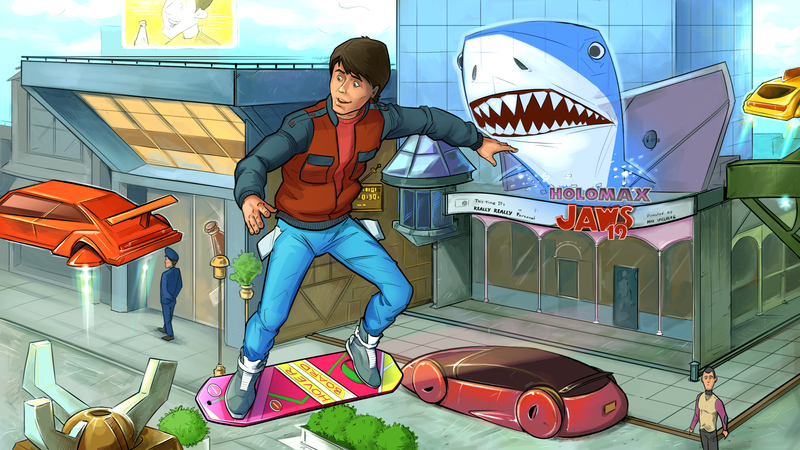 The Hoverboard is, by far, the most coveted gadget made up in Back to the Future II. No wonder this gizmo was heavily exploited in the popular culture throughout 26 years. In 2012, Mattel produced a beautiful replica, which, sadly, could not fly. Lexus’ prototype does hover in the air. But – it has to hover right above a metallic platform, and the entire hovering is for just ten minutes. Also, the thing is that the product is not intended for sale – just for bragging rights. Hendo’s hoverboard cannot fly everywhere, either, and cannot boast long battery time. Moreover, it costs approximately $10,000 – so a schoolboy would never afford it. There is a gizmo called Mr Hoverboard, which presupposes that you attach four Black & Decker vacuum cleaners to a board. The resulting gadget is a lot cheaper than Hendo and is capable of lifting 70 kilos. Though it’s not remotely a match to a true hoverboard. But another accurate guess in the movie hands-free gaming. And, of course, total dismissal towards the ancestors’ toy legacy from modern kids. As for the power clothes, the future in the movie also somehow leapfrogged the reality. The size-adjusting jacket with the integrated drying function, Nike MAG self-tying trainers, jeans worn inside out, dreadful double ties and other daring shots by Zemekis and Gale are still to be seen in the future. Obviously, laces are the most plausible of those predictions. It’s a long-term marketing project for Nike, and the company would never let it go. In 2011, the replica of the kicks from the movie was already sold as a limited edition (however, with regular laces). The company filed in several patents on lacing automation, and we are waiting a fully functional realization of Nike MAG by end of year. Whereas we still may live to see flying cars sometime in the future, personal thermonuclear reactors (Mr. Fusion) today are rendered a thing of hard-core fiction. Instead of over-the-top tech and power capacities we got efficiency and power saving. I doubt that Gale and Zemekis could imagine the lifestyle of today’s hero – the creator of the Soylent nutrient solution, Robert Reynart. Among his other peculiarities, he stopped using external electric grid to satisfy his modest electricity needs with solar batteries. There is nothing to counterpoise to thermonuclear reactors from the range of existing things, apart from Pepsi Perfect bottles, launched for the special date in a limited edition of 6500 pieces. But they, together with Nike laces, are part of ‘market cheating’ agenda. On the surface, it might seem that the creators of Back to the Future II did not make so many accurate guesses. On the other hand, as Bob Gale admitted in his recent interview, they never intended to foretell the future and just had fun. While fooling around, they accidently managed to shape the realities of the future – out of pure coincidence.